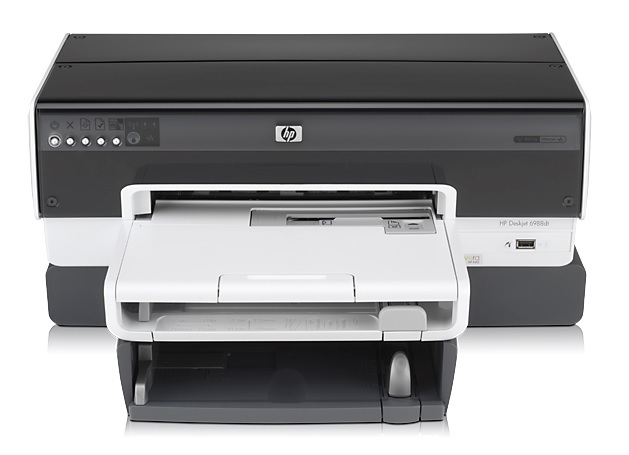 The HP Deskjet 6988dt workgroup inkjet printer is perfect for small offices. This colour inkjet printer offers high resolution and quick print speeds. It comes with standard networking connectivity. To promise better printing quality, the HP Deskjet 6988dt printer supports either four or six colour printing with optional photo colour or photo grey ink cartridges. This model would be better with a display on its control panel. The black HP Deskjet 6988dt inkjet printer measures 17.7 x 8.1 x 17.2 inches and weighs 19.62lbs. This model comes with an automatic duplexer for double-sided printing. It can handle a total of 400 plain sheets. The control panel of the Deskjet 6988dt printer comes with one-touch buttons for print cancellation and more. This model comes with USB and Ethernet ports as well as a PictBridge port for direct printing from digital cameras. The HP Deskjet 6988dt colour inkjet printer has a quick speed of 36ppm for monochrome and 27ppm for colour pages. Print resolution can go as high as 4800 x 1200dpi for colour documents, making it ideal for photo printing. What’s more, the HP 6988dt colour photo printer supports borderless printing. Workgroups can easily share this unit via Ethernet or Wi-Fi connectivity. To be able to handle complex print jobs, the HP Deskjet 6988dt colour inkjet printer comes with 32MB of memory. The Deskjet 6988dt photo printer would be better with the addition of features such as mobile and cloud printing support as well as a colour display.